William lived the closest to his mother, Jane, out of her three children. Jane had lived alone for many of her older adult years but was always surrounded by loving family and friends. William would always take the time to visit and bring the grandchildren around, act as the ‘maintenance’ man for big and small projects around her house, and he would always help to manage her finances. When Jane began to have serious medical problems over a period of ten years including a diagnosis of lung cancer, emphysema, a shattered hip bone, broken appendages from various falls, William took on the role of being his mother’s primary caregiver while balancing many other life responsibilities including a full-time job and raising his children. Although there are many types of formal caregivers such as nurses, nursing aides, or various other trained professionals providing some degree of assistance to your aging loved one, most often enough in the United States, the role of a primary caregiver is taken on by a relative or friend such as a spouse, child or close friend. Do you see yourself having to take on a caregiving role in the near future? Have you thought about how well you will be able to handle this responsibility? Below, Senior Living Link discusses potential tasks that a caregiver must take on, ways of handling stress, and a communication strategy to consider helping your voice be heard by your aging loved one, other family members, and professionals involved in your loved one’s care plan. Helping with personal care such as bathing, going to the bathroom, brushing hair, etc. Helping with transfers from bed to chair, passenger seat to wheelchair, etc. Offering companionship and helping your loved one to still be involved with family and friends. For example, picking them up for a family dinner and driving them back home. What are some common reasons that caregivers are needed? Ask for help. Delegate tasks and don’t try to micromanage tasks that other family members have offered to help with and reach out for more support when you need it! 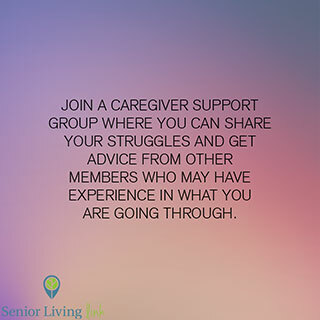 Join a caregiver support group where you can share your struggles and get advice from other members who may have experience in what you are going through now. Take time to enjoy activities that you like to do. Make sure you are still enjoying time to yourself and getting to socialize with other friends and family members. Use educational support. Often local hospitals or clinics will offer caregiver classes to help inform and instruct caregivers to make their tasks easier to handle and understand. Celebrate the little things. Don’t be afraid to give yourself a pat on the back and look for words of encouragement from other family members and friends. Take the encouragement to heart and embrace the gratitude. It is okay to recognize and celebrate the hard work that you have taken on and to remind yourself of the difference that you have been able to provide for your loved one! Assertiveness can often be confused with trying to be controlling or aggressive, but in fact, it is a way to fairly and confidently express yourself to firmly make a point. It is better to see assertiveness in the middle, balanced ground between being aggressive and being passive. Acting assertively on the behalf of yourself, the caregiver and your loved one can help to clarify points and effectively communicate between the two of you, other family members, friends, and medical professionals. Be aware of both your needs and your loved ones. Use “I” statements and empathy to clearly state feelings and point of view. This helps the person on the receiving end both understand and feel understood. Control the ‘controllables’. You can’t control how other people are going to react to what you say or how it makes them feel, but if you can control yourself and your feelings and recognize their reaction, your requests will be communicated (perhaps not complied with, but your point will be clearly made). Be open minded. Although you may have clearly stated what you wanted to communicate, it is good to remain open to feedback and criticism which allows for learning and reassessing. For example, you could be against the idea that your loved one needs to go see a certain specialist but listening to reasons why something might be necessary can help continue your loved one’s care in the right direction. Jane moved into an independent senior living community to remain active with her peers and to have less work to do around her home. She had more frequent hospitalizations from illnesses and from her difficulty breathing. A respiratory virus quickly turned into a bad case of pneumonia and William was able to arrange for home nursing care to help assist with the demanding schedule of taking care of his mom. Eventually, he also arranged for hospice to assist with more intervention and Jane’s request of being able to pass away in her own home. William was able to be by his mom’s side assisting with keeping her airway clear for her to continue breathing and talking to her and letting her know when family and friends stopped by to say, ‘I love you’. William was grateful for the opportunity to be able to take care of his mom at the end of her life in an intimate way and knows that it was his chance to say thank you for all that she did for him as a mom. If you are looking for senior housing for the next part of the caregiving journey visit Senior Living Link and start your search on your own or contact us and we can help by clicking here. Want to stay updated with our blog posts and other resources?